Characters are essential to a digital film because they tell the story through what they do and say. Audiences may not realize it but they build relationships with the characters in a film: They either love them or hate them. It’s good to have characters that are different from each other because it adds to the realism of your film. When writing your story, it’s a good idea to think carefully about your characters and to create a profile for each of them. Big-budget films and TV shows spend ages developing the characters before writing the scripts because understanding the character helps writers decide what the character will say or how the character will react to a situation. It’s also useful for the actors to read their character’s profile in order for them to better assume that character’s persona when acting and to know how to deliver the dialogue. It’s also important to keep all your characters different from each other. When your characters are too alike, your story won’t be very interesting. You may want to have one of your characters more worried than the others, one who’s brave, or one who’s quieter than the others. In one crew’s story, they created the characters to be very different from each other, and they wrote a profile for each character in their film. 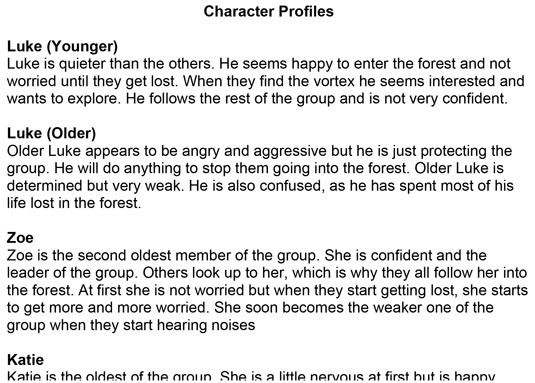 Writing profiles can help you create interesting characters.